Creating an overview of flood occurences in the districts Abim, Soroti, Katakwi and Kotido by text mining local newspapers. By Jurjen Wagemaker (FloodTags) and Eddie Wasswa Jjemba (RCRCCC). The Red Cross Red Crescent Clim ate Centre (RCRCCC), Red Cross Uganda and the German Red Cross are working to improve the disaster preparedness in floodprone Uganda. Using their new approach Forecast Based Financing (FBF) they use forecast-based thresholds on various timescales to trigger disbursement of funds and implementation of short-term actions – in the critical window of time after a forecast but before a disaster. Setting the correct trigger (knowing when to act) needs to be based on historical data on extreme events. Unfortunately in Uganda there is no single repository for such information and RCRCCC has been relying on several incomplete records from different sources. Interestingly, most extreme weather events are recorded in local newspapers. As it is too much work to review all the archives manually, FloodTags supported RCRCCC by automatically reading and interpreting the newspapers for information about historic floods events. The result is a historical flood map with dates of flood occurrences and links to the relevant news articles. In the next few months it will be used by Red Cross to set triggers for FBF and improve disaster preparedness in Uganda. As source data we used two newspaper repositories of Daily Monitor and New Vision and searched the databases using a large number of flood related keywords. From Daily Monitor we downloaded total 2974 news articles between 2004 and 2015. From New Vision we downloaded 752 news articles between 2001 and 2015. Unfortunately the database for New Vision could not be used fully, since the news repository has serious access problems (access to only top 200 newspapers per query, without possibility for advanced search). Within the database of total 3726 news articles, we clustered all sentences on the basis of similar features in the sentences and next we annotated the sentences using four classes: 1. Current flood event 2. Past event or flood warning 3. Mixed and 4. Unrelated. After annotation we found that total 1721 news articles held relevant flood information (annotated as class 1 or 2). For these articles we looked for geographical references (mentions of district and next for sub-county names in sentences containing these geographical related keywords). 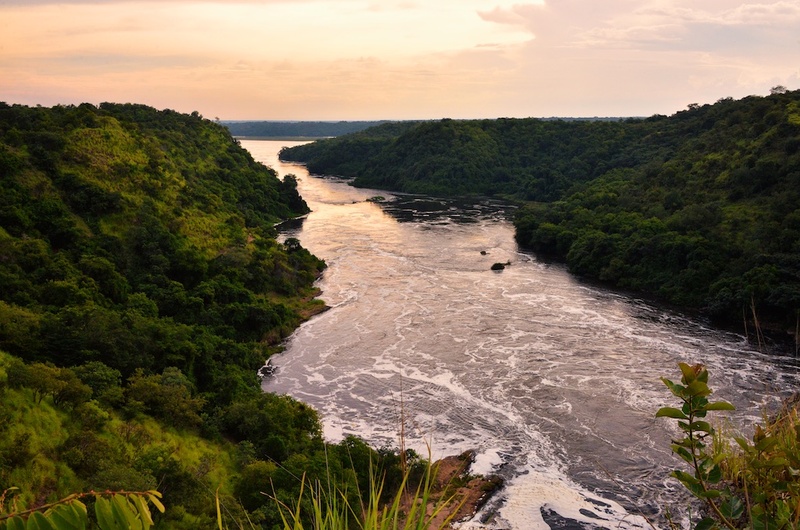 As a result, for the districts of our interest (Abim, Amuria, Kotido, Soroti and Katakwi - https://en.wikipedia.org/wiki/Districts_of_Uganda) we found total 63 news articles with flood sentences AND geographical reference. Applying the same approach to all districts in Uganda we found total 1173 of such articles (except in this case we did not only use the sentences containing geographical related keywords). Next, we validated the result manually for the districts of our interest. For 85% of the events we had found an actual flood event (the flood event was automatically detected for the correct month/ year in the correct location(s), while 15% were false positives (which we corrected in the map). For the flood reports on the whole of Uganda we may expect a margin of error of around ~15% (false positives). You can find the resulting tables and the historic flood map on this website. Red Cross Red Crescent Climate Centre and FloodTags are continuing their work on historic flood mapping, improving its accuracy and coverage. Two large improvements that can seriously improve the results are improving the geocoding database (we have found many errors in the OpenStreetMap database for Uganda) and improving the clustering methods (a.o. 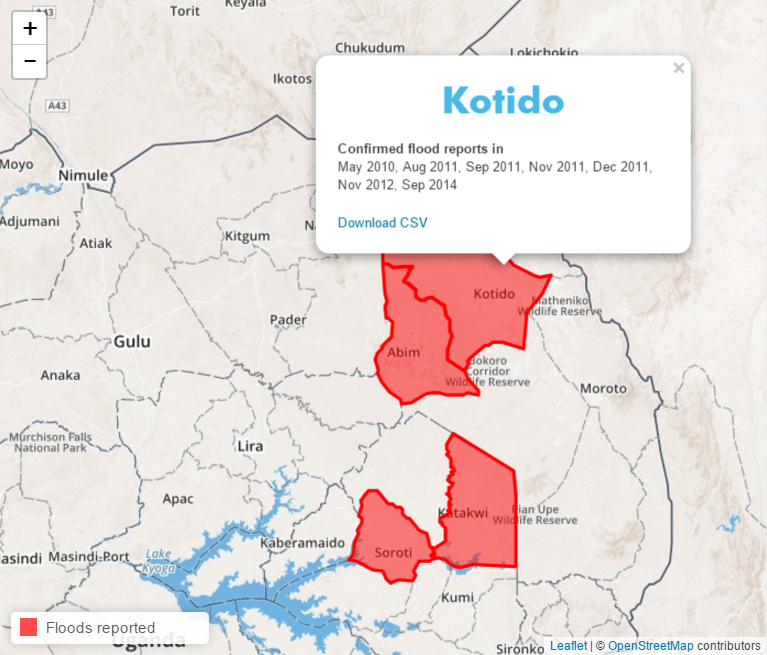 isolating different flood incidences including blocked roads and improving geocoding). A third improvement would be to negotiate access to a larger number of newspapers from New Vision or other local newspapers. If you would like to participate or otherwise be connected to the results, please contact us. This project was funded by the German Federal Ministry for Economic Cooperation and Development (BMZ).